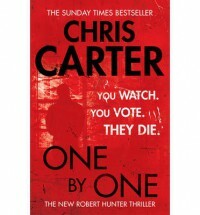 This is the fifth novel in the Hunter and Garcia series by Chris Carter. It will be published in German at June 16th 2014 as "Der Totschläger". His last published book was "Totenkünstler" and I thought it was very good. By now I can say this is a typical Chris Carter setup. The homicides are very brutal and unimaginable. When the first murder was described I could not sit still - I tapped my forehead and thought with disgust: that can't be true, it's so so gruesome ... (everyone should read the reading rehearsal). But like the other books by CC this book is also very suspenseful again. I have no clue who might me the bad guy by now and that's always a good criterion regarding a police thriller.